The "Billfisher"...a local legend, a 1973 53' Hatteras sold new by the Hatteras dealer in Mobile, AL to the McLean family who primarily used her to fish the Chandeleur Islands for speckled trout and redfish. A perfect Island boat. Today, 43 yrs later, she is still owned by the McLean family! She went through a total refurbishing from stem to stern, top to bottom, like no one has never seen...absolute open checkbook restoration. If the Hatteras Yacht Company had a collectors museum, the "Billfish" belongs there. Today she is available for sale. Owner will consider partial trade of quality center console. United Yacht Sales New Jersey would love to guide you through a personal showing of this 53' Hatteras Convertible 1972. 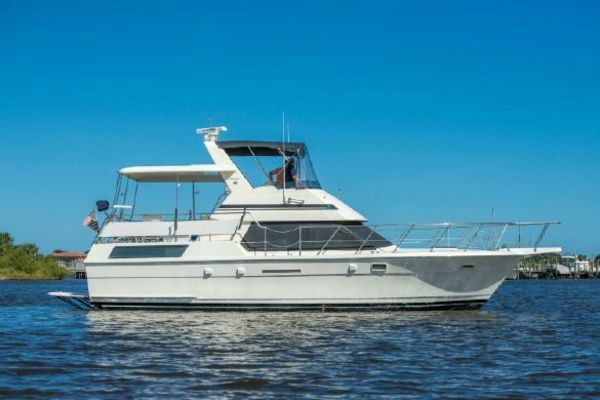 This yacht for sale is located in Orange Beach, Alabama and priced at $450,000. For a showing please contact us by filling out the form on this page and we will get back to you shortly! The "Billfisher"...a local legend, a 1973 53' Hatteras sold new by the Hatteras dealer in Mobile, AL to the McLean family who primarily used her to fish the Chandeleur Islands for speckled trout and redfish. A perfect Island boat.Today, 43 yrs later, she is still owned by the McLean family! She went through a total refurbishing from stem to stern, top to bottom, like no one has never seen...absolute open checkbook restoration. If the Hatteras Yacht Company had a collectors museum, the "Billfish" belongs there.Today she is available for sale. New aft bulkhead with all new tinted glass, totally refurbished cockpit factory controls with all new gauges, clutches,throttles, and a custom cover installed. To starboard is her tackle center w/sink, drawer storage, and a new3 drawer refrigerator. All new rod holders, shore cords and fixtures. All new stainless railing including aft rail, custom rod rack, and aft seating. Everything at the helm is new, gauges, controls, switches, all made factory perfect. All new electronics w/covers plus a new cover for the helms chairs and helm. 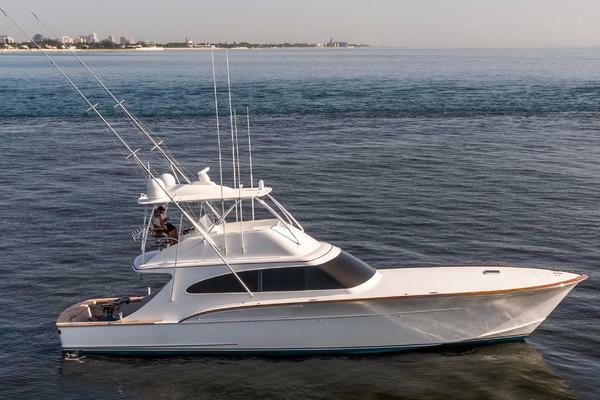 The radar mast is an absolute ultra cool Hatteras factory option. It was designed to hinge foreword, lay the Bimini top down and clear low bridges. They actually found new bridge spray shield with all new window frames. Did I say total new paint job including all nonskid, hull sides, cockpit, bridges, and feature stripes. Her bottom was blasted, epoxy coated, and all new bottom paint. Directly forward is a new factory standard Princess 3 burner stove top. Original electrical panel is showcased in the companion way. All factory unit lights and breakers are new. Totally customized with a twin berth inboard and a single berth outboard. Also has a filler cushion to convert to a giant king size berth. Private head and shower and lots of hanging locker space and drawer storage too. Features upper and lower 6'8" bunks, both with new cushions, covers, and decorative pillows plus access to head and shower. Mechanically perfect, impressively original shortof allof the upgrades; most every pump, allthe A/C units, battery charger, new Racors, new exhaust.Shows 280 engine hours; these are on the meters. It is reported that one engine was rebuilt and the other original. They run like low hour engines.Check out the upgrade list, nothing was left out!